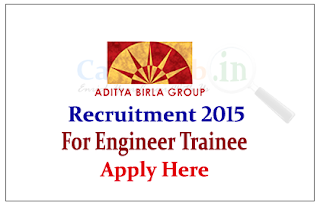 Aditya Birla Group is recruiting 2015 for the post of Graduate Engineer Trainee for the year of 2015. Eligible candidate can apply here on or before 06th July 2015. A US $40 billion corporation the Aditya Birla Group is in the League of Fortune 500. It is anchored by an extraordinary force of over 136000 employees belonging to 42 different nationalities. Eligible Candidates can apply online on or before 06.07.2015, for more details check official Notification. Optimize and deploy 2G & 3G cell sites regional capacity requirement plan and monitor radio network KPIs for their performance levels against specified standards to ensure quality network is maintained at a high level of New Site planning site surveys & compliance-Execution of optimization activities RF SURVEYS Network design & planning & Rollout to support traffic growth-Execute & maintain the Network deployment to uphold Network below 85% as per BSC utilization-Assist and support in optimization activities to maintain the Network Quality-Facilitate in resolution of network related customer complaints leading to higher satisfaction of the employees-Prepare & maintain the database for sending timely reports for adhering to the regulatory & compliances.